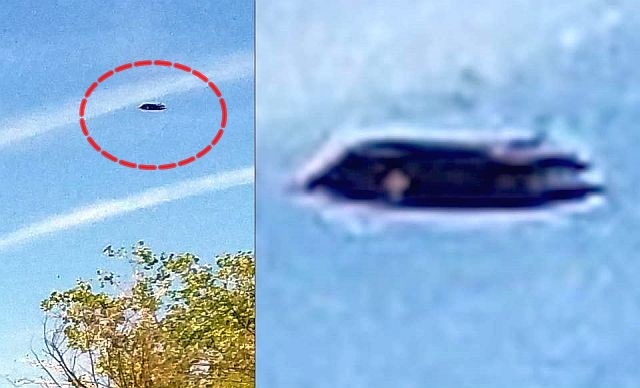 A strange craft has been accidentally photographed just at the moment the unknown craft flew over a lake outside Shoshone Wyoming. 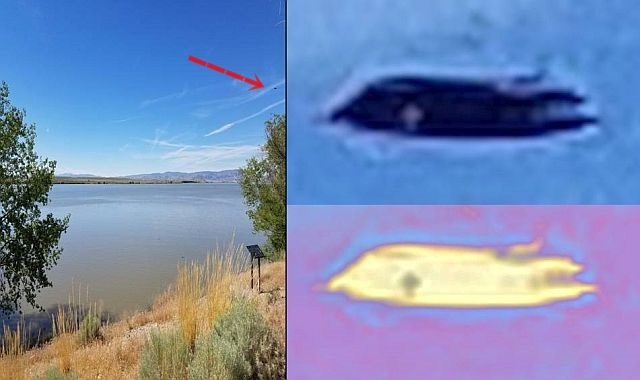 The photographer, a retired USAF employee said: On July 1, 2017 I was on my way home from Las Vegas when I had to use the restroom at Boysen Reservoir outside Shoshone Wyoming. After returning to my vehicle I realized that I had locked my keys in the truck. I called my wife to bring me the extra set of keys. I was less than 90 miles from my house. It would take her around 90 minutes to get to me. I snapped a couple of photos of the lake and sent them to my son. It was around 3pm. My wife arrived and was home around 7pm. I downloaded the pictures from my phone into the computer about 15 days later. When I looked at them on the screen something caught my attention on the right side of the picture a little over halfway up. I enlarged it and was not sure what I was looking at. I asked my wife to come look at it at normal size. She said "I see a lake and a UFO". We both studied it and cannot explain what we were looking at. I am retired USAF and after 20 years of service I can't remember seeing anything that looked like it. At the time I took the picture I did not see or hear anything. I would greatly appreciate any information that you could give regarding what this is. Mufon case 85445. Looks like the stealth fighter.